When you are looking for a waffle maker, one of the considerations is how many people you are likely to be cooking them for at any given meal time. For larger families, you’ll likely need a waffle maker that can make four waffles at a time. On the other hand, smaller families, couples and singles would not normally need as many and this is where double waffle makers are more useful. In this review, we are going to assess three top products in this category, and highlight which one we believe is the best double waffle maker. Apart from being delicious to eat, waffles should be fun too, and the Kangaroo Emoji Waffle maker certainly helps achieve that. It cooks two waffles with funny emojis imprinted on them which should bring a smile to everyone’s face. Eating food should be a pleasure, and some might even say it should be fun. So, it is great to see a product that strives to make eating waffles fun for everyone. Before we go any further we must explain exactly what an ’emoji’ is for those of you who don’t know what they are. An emoji is a cartoon face that can be used to add ’emotion’ to text messages or to show a reaction to ones you’ve received. For example, something which makes someone angry might mean they use the angry face emoji, or if talking about your pets, there are even emojis for dogs and cats. In fact, there is an emoji for just about every scenario. 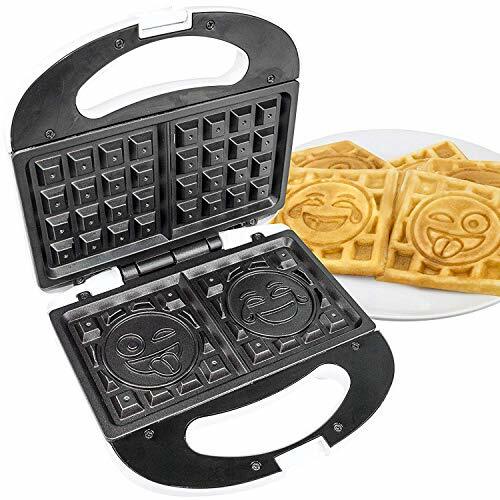 For the waffles you are going to be cooking with this double waffle maker the one on the left is the ‘crying with laughter’ emoji, which is one of our favorites. The other emoji is a face which is winking whilst also sticking its tongue out. This is used to signify something or someone who is wacky and zany. We’ll leave you to decide which member of your household that applies to the most. Now that you know the meaning of your emoji waffles, let’s look at how you are going to cook them with your double waffle maker. Simply switch on the waffle maker, wait until the indicator light comes on to tell you it has reached its cooking temperature, and then pour your batter on to the base cooking plate. By the way, both plates are non-stick, so they should be easy to wipe clean when you have finished cooking. Once you have poured sufficient batter to cook the two waffles, close the lid, lock it using the latch and the waffle maker will start cooking. This waffle maker has no temperature or browning controls so how long you leave the waffles cooking will depend on whether you want them dark, light, soft or crispy. When you have finished cooking, serve up your waffles and you will see the two emoji faces imprinted on one side. Kids will love them, and so will adults, although they may not admit it. In these days of electrical appliances, it is easy to forget that there are still plenty of products which allow you to cook in a more basic, and traditional way. The Happycall Double Pan Waffle Maker is one such product and is a fun and simple way to cook two waffles at a time. Cooking waffles with the Happycall Double Pan Waffle Maker is about as simple as it gets, and if you enjoy cooking without complicated gadgets that do it all for you, and take away all the fun, then you’ll love cooking waffles with it. It’s designed with two cooking plates, which are hinged, and each plate also has a handle with heat resistant grips so that your hands are protected from being burned when you lift the waffle maker. The handles are magnetic which means it should remain tightly closed when waffles are cooking inside. Obviously, there are no electrics involved so this waffle maker requires a stove or cooker top as its heat source. If you love cooking outdoors it could also be used with a camp stove. 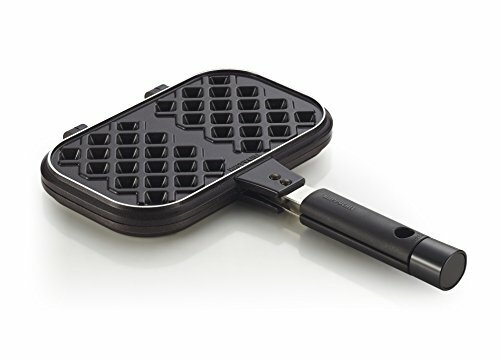 Although there are some waffles makers of this type that can be used on campfires or BBQs, we don’t recommend it with this waffle maker as there is a danger that the handle grips might melt due to their proximity to the cooking plates. To prepare to cook your waffles it is a good idea to put some butter or vegetable oil on the cooking plates to help brown your waffles and make sure they come loose when serving. The cooking plates are non-stick, so this is not essential, but it does help. Place the waffle maker on your stovetop and heat it for a few minutes. Turn over the waffle maker and heat the opposite side too. Pour in sufficient batter for two waffles and don’t be too concerned if you use too much. There is a channel running around the outside of the cooking area which will catch any excess. In fact, it is better to use too much rather than not enough batter. As you cook one side of the waffle, be aware of how long it has been on the heat. When you think enough time has passed, turn over and cook the other side. The time you cook will determine how light or dark your waffles will be. Non-Stick Coating with perfect waffle form. This is another double waffle maker which makes cooking waffles a simple pleasure. There’s nothing complicated about it, and it makes wonderfully deep and fluffy waffles. One of the frustrations we have with some basic double waffle makers that are designed to be used on stove tops is they are not suitable for use on BBQ grills. The reasons for this are normally that the handles are too close to the cooking plates or that they are fixed and cannot be removed. Thankfully, the GSI Outdoors Bugaboo Waffle Iron has removable handles, therefore, it can be safely placed on a BBQ grill, and you can enjoy waffles every bit as much as your steaks and burgers. The cooking plates are made from cast aluminum which is a great material for cooking waffles as it distributes heat evenly. This should mean that rather than waffles which are crispy in some parts and soft in others, the ones you cook with this double waffle maker will have even browning and crispiness throughout. Another issue that can often cause frustration with cast waffle makers is the depth of the plates is so shallow, that what they cook is closer to a pancake than a waffle. We love the fact that this waffle maker has deep pockets, so it will produce nice thick waffles which are ideal for fruit and other fillings. Cooking your waffles is very simple, and whether you are using a cooker top in your kitchen, a BBQ grill, or a camp stove, the process is very much the same. Heat both sides of the waffle maker plates evenly before pouring in your batter, and allow it to find its level. When you have the right amount, close the waffle maker. This is where there will be a slight difference in how to proceed. On a cooker top or camp stove when you still have the handles in place, you can lock the plates together using the metal loop at the end of the handles. On a BBQ grill, you might have removed the handles, so you may have to place something on top just to ensure the plates are sealed. Whichever cooking method you use, you need to turn the waffle maker over so that both sides are cooked and continue until you have your waffles at the color and texture which you require. When you’ve finished cooking, as the plates are coated with a non-stick material cleaning the waffle maker takes no more than soapy water and a wet cloth. We reviewed three great double waffle makers and we happily recommend each one of them. Nevertheless, we must choose our #1 product and so our best double waffle maker is the GSI Outdoors Bugaboo Waffle Iron. 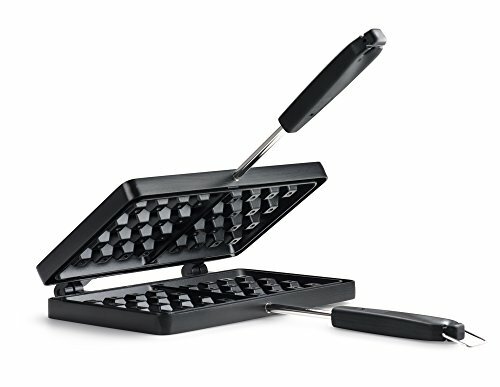 The fact the handles can be removed is a big plus, as it allows users to also cook waffles on a BBQ grill which is not always possible with this type of waffle maker. It is easy to use, makes cooking waffles fun, plus its non-stick plates make cleaning easy too. Finally, it has the lowest price of the three double waffle makers so there is another box ticked.